(Raccoon Dogs - Wishful Thinking - 03) The raccoon dog's diet depends on where they live and the season. They are omnivorous, and will eat just about anything they can find, from rodents, lizards, frogs, ground birds, seeds, fruit, berries, insects, and spiders. They are able to eat even toxic frogs and toads. 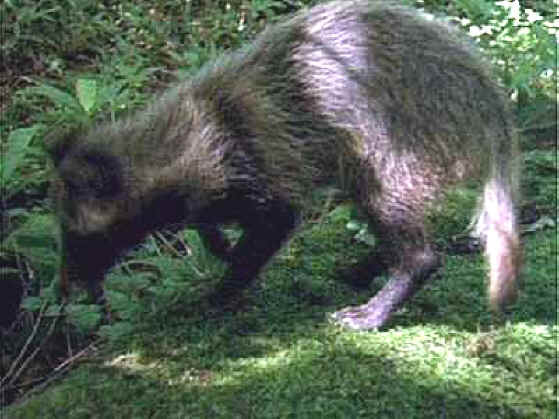 They cannot eat larger prey due to weak dental structure; the teeth of raccoon dogs are very small in comparison to other canids. Also, their carnassials are weaker, but they have more developed molars for chewing plant matter. which is a good indication that if there were an abundance of plant foods, they could easily become vegan. 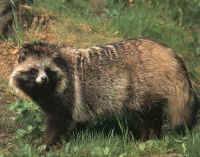 Raccoon dogs are primarily nocturnal animals, and they start to hunt for their food after sunset, taking a break at around midnight. They are rarely seen during the daytime. On their search for food, they can cover up to 12 miles (20 km) in one night. In areas where they live along the shoreline, they hunt on the beach at night for shellfish and carrion washed ashore by the tides.